UrbanCrazy » Happy Birthday UrbanCrazy – Sweet 16! This time 16 years ago, UrbanCrazy was registered as a new company, bringing what was then a predominantly seaside activity crazy golf to parties, offices and events nationwide. Loved by children, adults, skilled golfers and fun-seekers alike, miniature golf has great appeal to all. And UrbanCrazy has been at the forefront of bringing this to the masses ever since. 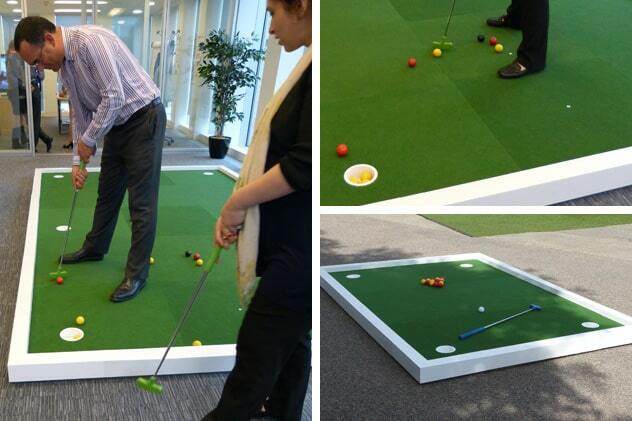 We have been thrilled to build, hire and sell portable courses to hundreds of events, people and companies from the UK to New Zealand and from Qatar to India, which just goes to show the universal appeal of all things minigolf! Over the years, we have come up with many exciting obstacles, such as: a laptop tunnel; a TV remote control arch; a beer bottle pouring amber nectar in to a glass; a rugby player with ball in hand; some Pringles snack tubes; a feature based on England football legend, Terry Butcher, complete with blood spurting out of his bandaged head; a giant Doritos dip pot; ten-pin bowling skittles with bowling ball; and a seagull perched on a sea-groyne, amongst others. In addition, we have created many specifically customised and bespoke features for our clients, from obstacles to borders, playing surfaces to playing equipment. All of this means that our courses are kept exciting and different from event to event and there is never a dull moment with an UrbanCrazy course. We have had the pleasure to have entertained at many different types of event, such as: award ceremonies; TV shows (over 30 appearances, including on: A Question Of Sport; The One Show; Blue Peter; Taskmaster; and Legomasters); weddings; university balls / freshmans fares; exhibitions; product launches; festivals; staff team-building; etc. UrbanCrazy has earned the trust of some of the finest venues and establishments including the likes of The Royal Albert Hall, The Grosvenor House Hotel, Wentworth Golf Club and Celtic Manor Resort. In addition, UrbanCrazy has also established itself as a market leader supplying miniature golf accessories and equipment to many of the numerous mini golf, adventure golf and crazy golf courses across the UK and overseas and have also gone on to build many courses as well as designing and advising courses worldwide. Our love for minigolf has seen us have an affiliation http://www.urbancrazy.com/images/CelticManor.jpgwith our friends at the BMGA (British Minigolf Association) and we are proud to be the long term sponsor of the Great British Minigolf Team. Choc Me Up – chocolate shawarma kebab stall – mmmm! UrbanCrazy would like to thank everyone who has worked with us and supported us over the years. We have loved every minute and look forward to continuing to bring exciting courses and games to you all and there is a HOLE lot more to come!